Iranians have taken advantage of “Ashura” to take to the streets and stage anti-Regime protests. According to news reports from Ahmad Andaryari a journalist, at least 8 protestors in Tehran, 4 protestors in Tabriz and 1 protestor in the city of Erdebil has been killed by security forces. According to the same report eye witnesses have stated that security forces have lost control in Tehran and their vehicles and motorcycles are being set on fire by protestors. • Protests in Tehran started around 11:00am on Sunday Morning (a day that marks Ashura). Thousands of protestors walked towards Azadi Square while shouting anti-Regime slogans. • According to a second news report from Human Rights and Democracy Activists in Iran from north to south and west to east of Tehran is filled with millions of protestors who were shouting anti-Regime slogans. • Even some security forces who are against the Regime as well as children and families as a whole have joined these protests. • According to this news report as well the security forces have lost control of Tehran and the protestors. • Young men and women are fighting back against the security forces and Basij by using rocks and bricks. In some locations protestors have been able to disarm security forces and given them beatings. • According to this news report at least seven (7) protestors have been killed while many others have been wounded. Among the wounded is a 6 years old boy who was transferred to “Amir Alem” Hospital. France News Agency-Tehran• The Nephew of Mousavi was shot to death during the protests. You are doing your fellow countrymen and women a great service and honor. 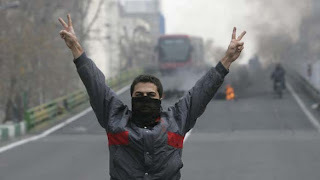 Freedom to the Iranian people!